KRK are a well‑established name in the world of studio loudspeakers, but the KNS series represents their first foray into headphone manufacture. The KNS 8400s incorporate many design features that are welcome in studio 'phones, such as a detachable cable and replaceable cushions for the ears and the top of the head. Said cushions are made of 'memory foam', which is supposed to mould itself to the shape of your head. Being largely made of plastic, the 8400s are also very light, and both factors help to make them very comfortable in physical terms. The earpieces rotate forwards through 90 degrees for storage or packing, though this doesn't really make the phones any smaller. 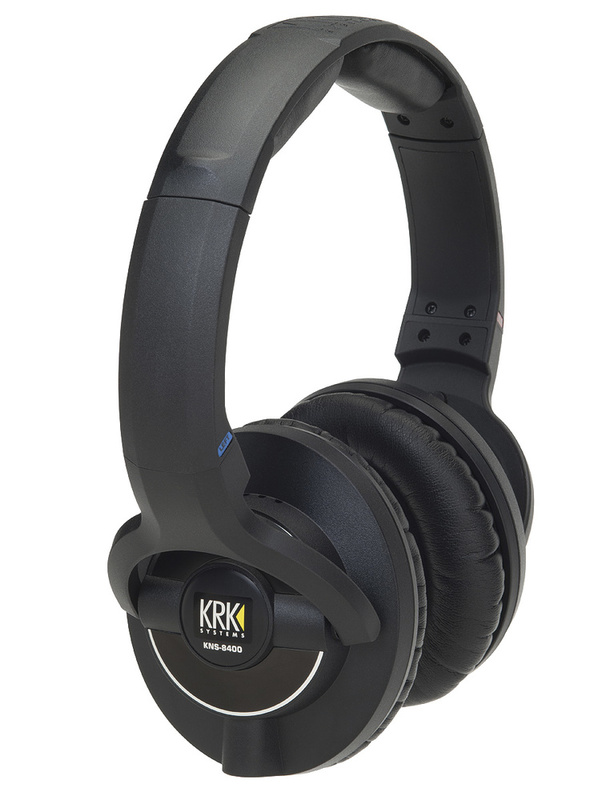 The KNS 8400s are, according to KRK, designed to reproduce the experience of listening on studio monitors as closely as possible — specifically, the experience of listening on KRK studio monitors. In some respects, I felt this claim was justified. For instance, I often find that it's harder to hear when things are out of tune on headphones than it is on speakers, but this was not the case with these headphones. The KNS 8400s also seem to mimic the tonal quality of some American monitors, with a very strong upper‑mid range. The low bass and extreme high end are certainly present, but it's the frequencies between about 1.5 and 4 kHz that jump out at you. This is a mixed blessing. I found it made them tiring to listen to for long periods, despite their very comfortable fit. However, I also found them a very useful mix checking tool. My usual headphones are Sony MDR 7509s, which have a much softer frequency balance, and although I still think they're great, I've come to realise that they have a few blind spots (or perhaps that should be deaf spots?) in the mid‑range where problems can creep in unnoticed. Switching between them and the KNS 8400s a few times was a great help in making the mids solid and full, yet not too bright or harsh.